Poisoned Pen Press, 9781590586228, 255pp. Sam Blackman is an angry man. A Chief Warrant Officer in the Criminal Investigation Detachment of the U.S. military, he lost a leg in Iraq. His outspoken criticism of his medical treatment resulted in his transfer to the Veteran's Hospital in Asheville, NC. Disillusioned with the military, grieving over the recent death of his parents, and at odds with his brother, Sam's life is in shambles. Then an ex-marine and fellow amputee named Tikima Robertson walks into his hospital room. Tikima hints she has an opportunity for Sam to use his investigative skills--if he can stop feeling sorry for himself. But before she can return, Tikima is murdered, her body found floating in the French Broad River. Sam was the last person to see her alive. Tikima's sister, Nakayla, brings Sam a journal she finds in Tikima's apartment. A note stuck to the inside cover reads "For Sam Blackman." The volume dates to 1919 and contains the entries of a twelve-year-old boy who accompanies his father, a white funeral director, as they help a black man, Elijah Robertson, transport his deceased relative from Asheville to a small family plot in Georgia. The link to the present? Nearly 90 years ago, Elijah's body was also found in the French Broad River, a crime foreshadowing the death of his great-great-granddaughter Tikima. Sam and Nakayla must delve into Asheville's rich history, the legacy of the Vanderbilts at the Biltmore estate, and of author Tom Wolfe to uncover the murderous truth. *STARRED REVIEW* “A wealth of historical detail, an exciting treasure hunt and credible characters distinguish this fresh, adventurous read.” –Publishers Weekly of Blackman’s Coffin *STARRED REVIEW* “Known for his effortless storytelling, de Castrique once again delivers a compelling tale blending fact and fiction….” –Library Journal of Blackman’s Coffin “In the struggling Sam Blackman, de Castrique (Final Undertaking, 2007, etc.) 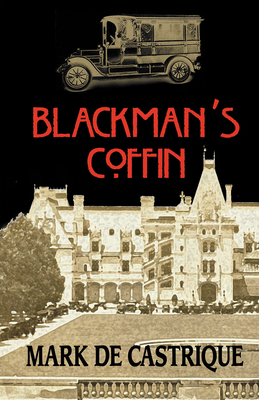 has created a compelling hero whose flinty first-person narrative nicely complements Henderson's earnest, measured and equally involving account.” –Kirkus Reviews of Blackman’s Coffin .